Pick up from your hotel in Shanghai afternoon and then drive to Shanghai train station. Board the overnight soft-sleeper train to Guilin (4 beds in a cabin). Arrive in Guilin noon time and be met by the local tour guide at the train station. Transfer to have lunch and then start your sightseeing of Guilin. You will visit the marvelous Reed Flute Cave, featured with Karst stalagmites in various lively shapes, like bird, curtain, flower and animals. Another sight is Elephant Trunk Hill – the symbol of Guilin. The hill, with its body half in water and half in land looks like an elephant drinking water, hence the name. 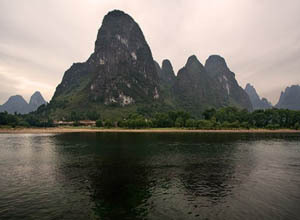 Morning enjoy the cruise down the Li River to Yangshuo. The cruising lasts 3 hours. The Li River landscape is known as ‘top in China’, with clear water, karst maountains, and a taste of idyllic life far removed from the concrete metropolis. Arrive in Yangshuo county, a must destination in Guilin. Appreciate the countryside scenery and have a stroll in the West Street, the main boulevard in Yangshuo with souveir shops, boutiques and cafe alongside, most of which are opened by foreign expatriates who admire the county life. Drive back to Guilin train station to board the overnight train back to Shanghai. Arrive in Shanghai in the afternoon and be transferred back to your hotel in Shanghai. *Soft sleeper train tickets: Shanghai-Guilin, Guilin-Shanghai (4-berth-cabin).